Iruka N. Okeke is a professor of microbiology Haverford College, PA. She received a Bachelor of Pharmacy, Masters and Doctorate degrees from Obafemi Awolowo University Nigeria and was a Fulbright pre-doctoral fellow at the University of Maryland. Prompted by her Maryland adviser, James Kaper, Okeke joined the ASM as a visiting graduate student in 1997. Following post-doctoral training at Uppsala Universitet Sweden and the University of Maryland, she taught microbiology briefly at the University of Bradford, UK before assuming her current position in 2002. 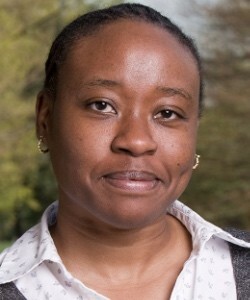 Okeke connects people to microbiology as an educator and ASM mentor as well as by advocating for antimicrobial resistance containment. She is or has served as a consultant on antimicrobial resistance for the Alliance for Prudent Use of Antibiotics, the Centers for Disease Control and Prevention, the Disease Control Priorities Project, the Center for Global Development and the World Health Organization.